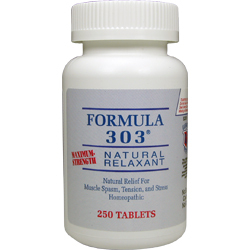 Formula 303 ® is registered in the U.S. Patent and Trademark office for relief of Muscle Spasm, Tension and Stress under Registration No. 2,965,955. Formula 303 ® is a registered trademark of Dee Cee Laboratories, Inc. ®, White House, TN 37188 for the sole use of Dee Cee Laboratories, Inc. ®, and is protected by Registration No. 2,965,955. Each Tablet Contains: 6 parts Valerian Root (Quad-Strength) 1X, 3 parts Passiflora (Quad-Strength) 1X, 1 part Magnesium Carbonate 1X. Directions: Adults and children 12 years of age and older, take as directed or as directed by your doctor. Muscle Spasms - As a muscle relaxant, two tablets every three hours until relief is obtained. Then two tablets with each meal and two at bedtime. Tension and Stress - As a relaxant, two tablets with each meal and two at bedtime. Warning: If you are pregnant or nursing a baby, seek the advice of a health professional before using this product.